Eat, breath, train, bat and repeat - a routine that Virat Kohli has been insisting on since last three years or so. And with the results by his side, he has been a superstar in the world cricket. The 30-year-old struck a magnificent ton (123) on Sunday, 16th December against Australia at Perth and revived Indian team from drowning. Something that is not new to the Indians. With the ton, skipper Kohli has equalled the record of the most number of centuries by an Indian against Australia. Sachin Tendulkar with Virat Kohli, now jointly holds the record of 6 hundred. Enroute to his 25th test ton, Virat Kohli broke several other records as well. 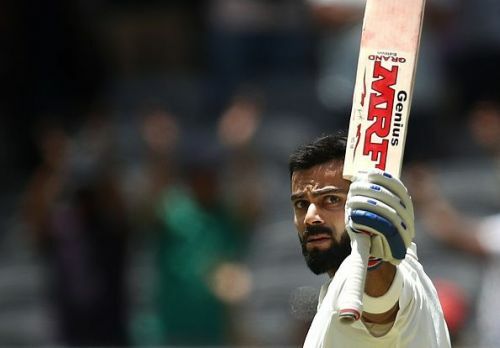 He became the second fastest to score 25th test tons surpassing his childhood hero, Sachin Tendulkar who did it in 130 innings whereas king Kolhi achieved it in 3 innings fewer. Being consistent for so long is in itself an art, and King Kohli has proven himself to be the master at that. Virat Kohli has struck 22 centuries in last two years across the formats, 11 of them have come in 2018. Kohli has also become the 11th batsman to complete 1000 Test runs in a calendar year overseas.